Working with a barn builder can feel overwhelming, especially if you’re new to the process. Quarry View Construction’s professional team helps eliminate that frustration and builds quality, long-lasting structures by using technology throughout the barn design process. To share a behind-the-scenes look at how we design horse barns, equestrian facilities, garages, and other structures, we spoke with our in-house designer, Paul Campbell. Paul started his career as a driver for Amish work crews. Later, he worked as a construction laborer before moving into drafting. Paul now works closely with clients and QVC project managers using 3D modeling program SketchUp, which allows him to quickly and efficiently design high-quality structures. We handle your design, start to finish. At Quarry View Construction, the entire design process is handled in-house. Paul says, “Our process gives you a much more accurate depiction of the project. The 3D modeling is much more artistic and easier to interpret when you’re not necessarily used to looking at the lines and symbols on a traditional architectural drawing.” The full-color renderings create a very realistic set of plans that take the confusion out of the building process. Some jurisdictions, like a borough or township, require an architect’s seal as part of the building process. If you’re building a garage or other structure in an area that requires that designation, we’ll work with licensed professionals who can review and approve the architectural design. We collaborate closely with you to build the barn you want. The QVC team starts the barn design process by talking about your needs, wants, and budget. It’s a conversation that gives us the foundation to create an initial model. “The first model is intentionally designed to be very simple, because it gives us the ability to discuss details and iron out what you’re looking for in your barn. For example, we can easily move door or window placement as we work through each version of the design,” Paul says. The structure’s design continues to evolve until it reaches the final rendering, which provides a realistic, full-color depiction of how the barn will actually look on the property. We use computer-aided design to help crews build a better-quality barn. 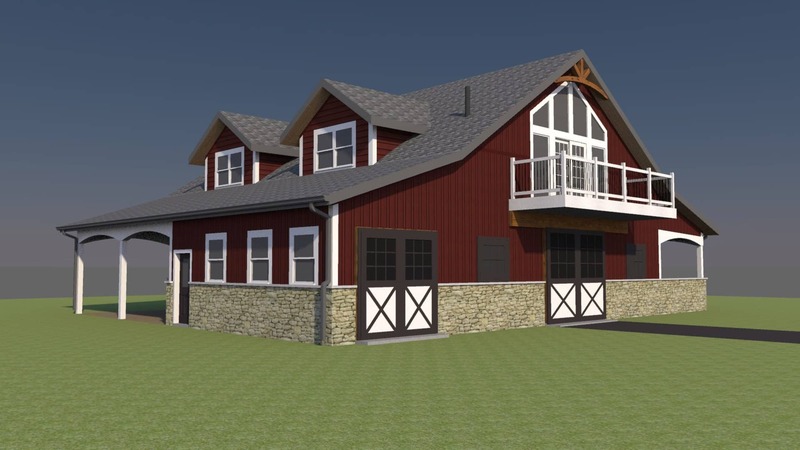 Using 3D modeling software does more than help our clients visualize and plan a dream barn; it helps our work crews build a better structure, too. They use the construction drawings we produce to work more efficiently and eliminate guesswork from the barn building process. As a result, they produce a higher quality product that meets expectations—both ours and yours. We build barns that blend modern design technology with Old-World quality. Modern technology is just one facet of the process we use to build long-lasting structures, like barns and garages. Discover more about our unique process in Amish Horse Barns: Why Old-World Quality Matters. To get the barn design process started on your dream structure, contact the QVBG team.